The president and opposition have lost legitimacy. We deserve better. History tells us that summer months are often eventful in Congolese politics. It was on 30 June 1960 that the country gained independence from Belgium. On that day, Belgium’s King Baudouin declared: “the Congo constitutes the culmination of the work conceived by the genius of King Leopold II, undertaken by him with tenacious courage and continued with perseverance by Belgium”. These comments were laced with more than a hint of irony. The young king marked the country out for what it had been and, in an inadvertent show of foresight, for what it would later become: a playground for “big men”. Pillaged and plundered under the guise of the Congo Free State during colonialism and then in its current state as the Democratic Republic of Congo, our beleaguered nation has known countless big men. These individuals have toyed with state finances, institutions, and even the Congolese people for personal gratification. From President Mobutu Seso Seko (1965-1997) – the shrewd manipulator of Cold War politics whose reign collapsed 20 years ago this week – to Laurent-Désiré Kabila (1997-2001) – a man Che Guevara abandoned after judging him not to be “the man of the hour” in the 1960s – our Congo has been consistently denied strong and progressive leadership. The current regime of Joseph Kabila, having a strong understanding of playground rules, has sought to tighten its grip on power. After his initial ascent to power in 2001, Kabila secured a mandate in 2006 and then a questionable victory in 2011. In those latter elections, I campaigned for a free and fair democratic process. Back then, many of us had a deep anxiety about the direction our country was taking. So it was no surprise last year when Kabila refused to step down even though his term was due to officially end on 19 December. In so doing, the president almost shattered that most resilient of elements in our nation: hope. That hope turned to discontent as violence erupted across the country with protesters airing their anger. In an effort to quell this dissent, Kabila agreed in November 2016 to install Samy Badibanga from the opposition Union for Democracy and Social Progress as Prime Minister. This bypassed the widely expected announcement of Vital Kamerhe, another opposition figure and leader of the Union for the Congolese Nation. In office, Badibanga was humiliated by Kabila and left in April. In power, the Kabila family has been instrumental in the sale of many mineral assets in suspicious deals, most notably to Dan Gertler. The Israeli-born mining mogul, who is currently under investigation by the UK Serious Fraud Office for his dealings with Congolese mines, appears to hold considerable favour with the president. Debrouillez-vous (“fend for yourself”), Mobutu’s defining mantra, characterises the behaviour of so many of Congo’s leaders today. With a non-existent government budget, public services have crumbled. The capital Kinshasa, once affectionately named “Kin La Belle”, sits in uncollected refuse. And despite the vast resource wealth of our nation, an obscene 9 out of 10 Congolese live on less than $1.25 a day. As big men come and go, they bring with them their own varieties of corruption, theft and inaction. We have long been robbed by foreign actors from afar, and now we are also robbed from within by our own elites. Yet to lay the blame solely at the feet of President Kabila would leave the diamond only half cut. Good governance also requires a unified, rigid opposition, but the Rassemblement group of opposition parties has largely failed. The coalition has been dogged by internal disputes and is made up of leaders that are criticised behind closed doors for having fallen into line with Kabila, intent on sharing the spoils. The president is playful in his use of spectacle, publicly inviting opposition leaders to the presidential palace who, doe-eyed at the prospect of being invited to form a government, soon leave, their legitimacy in tatters. To add to this, the death of figurehead Etienne Tshisekedi in February has left the opposition with no single politician with the popular legitimacy to lead it. Moïse Katumbi, a high-profile businessman and former Governor of Katanga, has been touted by some as a potential candidate to take on Kabila. His fans say he performed an economic miracle in Katanga; his detractors say it was not so remarkable given the province’s resource wealth and the global resource boom at the time. But either way, Katumbi is currently in exile for fear of arrest after being accused of the improper sale of a house. He insists he will return and has openly accused Kabila of trying to tighten his grip on power by stalling the elections. But his refusal to return suggests he could be closer aligned with the Kabilas than he lets on. This April, the president’s appointed Bruno Tshibala as Prime Minister. In doing so, he ignored the opposition’s choice, Felix Tshisekedi, and the part of the December 2016 agreement outlining that the opposition would propose the new PM. This development further highlights the need for the Rassemblement to act decisively. Kabila has shown that he is only too willing to do so when pursuing his interests. As the Congo marks the 20th year of Kabila-family rule this week, the moment is right for the injection of a new political movement. This movement would facilitate social healing, working through injustices of the past and plotting a bold vision for the future to benefit the many and not the few. It would defend the people’s right to good governance and strong leadership, and to the democratic principles enshrined in the country’s very name: the Democratic Republic of Congo. On 20 May, an important conference takes place in Kinshasa. This gathering will bring together civil society leaders and activists from organisations such as the Council of Catholic Churches (CENCO), l’Association Africain de Defense des Droits de l’Homme (ASADHO), Voix de sans Voix , and Femmes solidaires pour la paix et le developpement. Together, we will reflect on the past 20 years and discuss the prospects for this new movement that can speak to the will of Congo’s citizens. It will also be a tribute to the amazing, enduring and remarkable spirit of the Congolese people. The slogan for our conference will echo the great cry issued by football fans when their team is down but not out: Congo Remontada. Congo Come Back! The congo since 1885 has been under the yoke of exploitation and tyranny to this day. No longer, despite many valid instances, can the failure of the congo be blamed on the colonial powers and outside influences of corruption when there is to be found, no valid leader, nor political party, strong enough to effect change. Bad governance, lack of work at a living wage to bring back the dignity of men who turn to arms instead of shovels, education that leads to no jobs, massive mineral wealth misused and pocketed by few to the detriment of many. The congo is a failed state, the congolese people are brave, dynamic, capable but unable to break through since they lack unity under a singly dynamic leader. Obama was wrong, AFrica needs strong men, without them they will never have strong institutions. I know I have lived and worked in the Congo (Zaire) for 32 years and watched the country continue to live a parallel life in order to survive since the government is useless. The congo will succeed only if the congolese take their future in their own hands, and that will never be easy. To deny the fact that colonization’s viciousness has nothing to with DRC’s current state of affairs is a stomach-churning naivety or a cruel insolence. The psychologic weight of the violence and humiliation that lasted almost a century was prolonged by the cold war chronicle and now with the scramble for Africa saga. 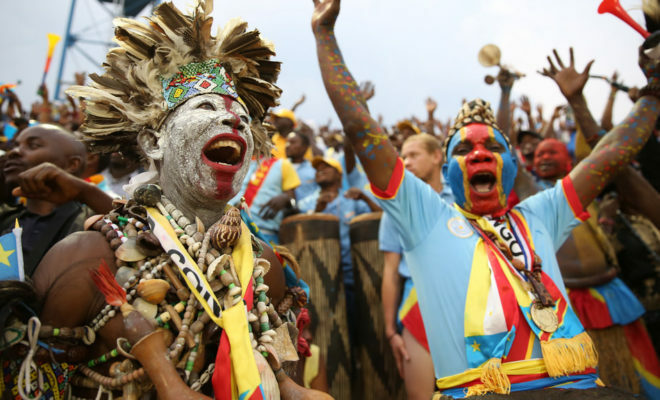 It is unfortunate that the romantic anthem “The Congo will succeed only if the Congolese take their future in their own hands” hasn’t lost its potency. This romanticized the struggle for social justice anywhere in the world. What do the DRC need? Pure luck!!! There is plenty of blame to pass on around. It is hard to phantasm things can get better with a Congolese elite full of emotional and intellectual midgets who are colluding with vicious wester predators under the guidance of lumpenintellectuals. To add gasoline to the fire, the vast majority of Congolese do not own or can acquire means of participation to enterprises or dialogues of the 21st century. DRC ought to sacrifice the current generation to come for the next generation to become humans. This is not from somebody who worked in Congo (Zaire), but a Congolese born and globally bottled individual.